Do you remember when solar panels were ridiculously large and expensive? Thankfully, those days are behind us. Now anyone can use solar energy, which is great news for us backpackers. And now finding the best solar panel for backpacking is a whole lot easier than it used to be. For less than the cost of a good meal in Italy, you can own a portable solar panel and never worry about running out of battery power again. Allow me to relate a personal story. In 2004, I was teaching English in South Korea. Over the Christmas break, I went backpacking through south-east Asia. My route included Vietnam, Cambodia, and Thailand. I was rocking a Blackberry 7100t, the original smartphone. That device enabled me to plan my routes, keep in touch with friends and family all over the world, stay on top of weather updates, and even purchase train and bus tickets. But all of that was useless in Vietnam and Cambodia, where chargers were few and far between. My phone was dead for most of the trip. When I got caught up in a tsunami in Thailand, I was unable to tell my family back home that I was okay. A portable solar panel would have changed all of that. What is a backpacking solar panel? Is There a Best Solar Panel for Backpacking? We are dedicated backpackers. We’re also enthusiastic about technology that helps us to backpack. Whether it’s camping overnight in the woods or trekking around the world, technology can make the journey easier and safer. Solar panels are a perfect example of this. With a portable solar panel, you will always be able to charge your phone and tablet. Your GPS will never run out of juice. You can even keep your camp lit up at night. The best solar panel for backpacking is able to charge all of your gadgets. But finding the best one requires some digging. There are a lot of options to choose from. As the cost of cell technology comes down, more and more manufacturers are getting into the market. Overall this is a great thing. Solar panels are the most environmentally-friendly way to produce power, and competition is good for consumers. However, not all of the choices are worth spending money on. The last thing you want to do is drop $ on a solar panel that stops working after 2 charges — which is why it’s a good idea to learn about solar panels before you buy one. A backpacking solar panel is basically a small, portable solar panel you can use to create electricity and charge your devices. Most of them are folding three-panel units which you can unfold to capture the suns rays, and then neatly fold back up for easy storage in your backpack. Some units are small hand-held devices with a single panel. These take a lot longer to charge. 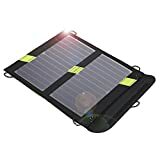 The best solar panel for backpacking tends to be small enough to use easily but able to capture enough of the suns rays that it can charge quickly. Recently, solar backpacks have appeared, which has a large solar panel built right into the face of the backpack. The idea is good because the panel will charge while you’re wearing the pack and you don’t have to do anything. Unfortunately, backpacks tend to take a lot of abuse, and these panels break quite easily. 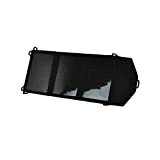 We don’t consider most of these to be the best solar panel for backpacking due to their fragility. All solar panels work the same regardless of size. Behind the glass, which covers the solar panel, are a series of photovoltaic cells. In here, particles of light called photos are funneled where they knock electrons off of atoms. That action creates electricity. To get the atoms in there, they use opposing magnets on the top and bottom of the cell, usually silicon and phosphorous. Then, metal plates in the cell collect the electrons where they travel into wires. Once the electrons are in the wires, normal rules of electricity apply. With large solar power units, you need a converter and an inverter to make that energy become usable for everyday electronics. Here in America, everything charges at 110-volts, so we need to turn that raw energy into user-friendly voltage. With backpacking solar panels, the converting happens inside the charging unit. When you plug your device in, the converted energy is already the right wattage and ready to go. The best solar panel for backpacking needs to be easy to use. Because you’re traveling far from home, and often far from electrical outlets, you need to be able to keep your phone charged. Whether you’re in wooded foothills of Montana or on a train in central Europe, the ability to recharge your phone, tablet and other electronic devices can be a lifesaver. We highly recommend keeping your smartphone charged up. If you’ve downloaded maps of your travel area, you’ll be sure never to get lost. Also, the ability to call for help when needed can’t be understated. The great news is that the best solar panel for backpacking isn’t very expensive. You can expect to pay between $ and $ for a standard backpack solar panel, and up to $$ for a premium version. Looking at each solar panel with these factors in mind helped us to determine which was real and which was garbage. But that wasn’t enough. Because we want to find you the best solar panel for backpacking, we checked out customer reviews to see what real customers had to say. If any panel failed to satisfy most of its customers, we discarded. Eventually, we came up with a decent list of solar panels you can use for backpacking. To be honest, assembling this list was a lot of fun. Just the idea of being able to charge your LED flashlight or your smartphone from anywhere is liberating. We can recommend every single one of these solar panels, but if you’re looking for the best solar panel for backpacking, you’ll need to wait until the end of the list. Also, note that we didn’t list these in any particular order. First up in our review is the BigBlue 28-watt solar charger. What we like about this system is that it has four panels in an accordion-style foldable case. There are 3 USB ports for charging, and at 28-watts, this thing will have no problem charging them all at the same time. Thanks to a polymer film over the panels, you don’t have to worry about getting them wet. They can handle light rain or mist without a problem. Best of all, it only weighs 20-ounces, which means you’ll hardly feel it in your backpack! You’ll pay between $ and $ for the BigBlue. On Amazon, customers gave it 4.1 out of 5 stars. Many of them praised how quickly it can charge a phone. Those four panels capture a lot of sunlight, and customers loved this fact. Unfortunately, there were many complaints that it quit working on people after a month or so of usage, although not for others. Your mileage may vary. 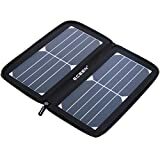 Easy To Carry: With compact size (11.1 × 6.3× 1.3in folded or 33.1 × 11.1× 0.2in opened) and lightweight (20.6 oz) design, BigBlue foldable solar charger panel bag is small and light enough to fit into any camping backpack, hiking daypack, or emergency kit. Triple USB Ports Power: 2 USB Charging Ports with SmartIC Technology and each port supply the optimal charging efficiency up to 5V/2.4A max. The 3 USB Ports can offer the total current at 5V/3.4A. Automatically Adjust Current and Auto-Restart function, no need to connect again when passing under shadow or cloudy days. High Energy Conversion: Highly efficient sunpower panel convert up to 21.5-23.5% of solar power into free energy. This special pet polymer surface protects it from occasional rain or wet fog and all the ports are covered by a cloth flap and rubber cover to protect them from dust or water damage. Package & Warranty: BigBlue 28W Solar Charging Panel, 50cm Micro USB Cable, User Manual, 24-Month Warranty And Friendly & Customer Service. Next up is a big 3-panel solar charger which puts out 21-watts of power. We love that this device is rugged. A tough canvas protects the big panels, so if your bag gets bashed around, your charger will be safe. Also, you can charge two devices at the same time, and the charger can identify your device and provide the right amount of juice to create a fast charge. That’s tech we can get behind! It costs between $ and $ and comes with a 1-year warranty. Customers gave it a whopping 4.5 out of 5 stars on Amazon. Almost all of them loved that this solar charger looks really nice, and many commented that it feels sturdy and withstands punishment. There were complaints that it has trouble charging iPhone 7 and Galaxy Note devices, for some reason. The ECEEN solar charger panel is one of the smallest units we reviewed. At 11 inches by 6 inches, this thing is about the same size as your smartphone. It has a fabric case with a zipper, so it looks like a wallet. You can unzip the case, and it folds out to reveal two ultra-light solar panels. It only comes with a single micro-USB charger, so this isn’t going to be very useful if you have an iPhone or anything using a newer USB type-C input. On the other hand, it only costs between $ and $ and comes with a 12-month warranty. Customers on Amazon gave it 4.0 out of 5 stars. Many people wrote that the charge is consistent and powerful, and it has their phone up and running quickly. However, there were a few complaints that the charge is weak, and if a cloud or shadow passes over, you need to completely restart it. HIGH EFFICIENCY: The Solar charger made by SUNPOWER highly efficient solar cells convert up to 22%. The charger utilizes natural sunlight to charge your device, It's a green charger without battery and not too heavy to carry. USB SMART OUTPUT: Built-in Smart IC automatically adjusts to connected devices and provides the optimal charging current to minimize charging time, It detects connected device input and distributes current output accordingly sunlight level. COMPACT CARRY: Compact size (11.5 x 6.0 in. folded / 12.8 × 12.0 in. open). Lightweight (0.8 pounds) and ultra-thin (1.0in folded) lightweight foldable design make it great for camping, hiking, picnics, and other outdoor activities. ZIPPER PACK DESIGN: Foldable zip pack exposure to damp conditions will not damage the exterior part of the solar charger. The wave straps on backside of solar panel make it easier to hang, removable, attachment to backpacks, trees, or tents. PACKAGE: You will get 1 - ECEEN 10W solar panel charger, 4 - carabiners, 1 - 40cm Micro USB cable, 1 - instruction manual. 12 months warranty. Here’s another fold-out three-panel solar charger which fits into your bag easily. It puts out 10 watts and has two 5-volt USB ports for charging anything. Because it only weighs about a pound, you won’t even notice you’re carrying it. Overall it looks more like those CD cases you would keep on your car visor than a charging pack. But when your phone is out of juice, who cares what the charger looks like? You can own this for between $ and $. On Amazon, customers gave it 4.1 out of 5 stars. Many of them wrote that this is a powerful, easy-to-use unit which provides a steady and reliable charge. One missionary used it in the jungles of Papua New Guinea for six months! The only complaints were that it takes a long time to charge. The X-Dragon has some nifty features you won’t find in other solar chargers. For starters, it has a smart IC chip inside which will adjust the ampage depending on light conditions. So if it’s cloudy, it will pump up the amps, so your device gets a consistent flow of electricity. When it’s sunny, it will throttle it. Two solar panels fold out in a sturdy canvas case. Because the entire unit is water-resistant, a bit of rain won’t hurt it. The X-Dragon will pump out 14-watts of power, and it only costs between $ and $. Customers gave it 4.2 out of 5 stars on Amazon, with most saying it worked well and didn’t let them down. A few mentioned that it takes longer than some other chargers. Next is the Venture 30 from one of the longest-running solar panel manufacturers, Goal Zero. We love this pack because it has two USB ports for charging, but also a built-in micro-USB tip so you can just pop your phone right onto the unit without any need for cables. Also, there’s a built-in LED flashlight on the case. Two 15-watt panels provide plenty of power, and they’re completely waterproof. You can dunk it or splash it while it’s charging. Expect to pay between $$ and $$, however. Customers on Amazon gave it 3.7 out of 5 stars. Many of them said that this was the perfect backpacking companion. It works every time, it’s incredibly tough, and it’s weatherproof. Some people complained that it’s too bulky and also that the charge was inconsistent. Finally, we looked at the Anker 15-Watt solar charger. Anker is a leading name in electronics. That means we can trust that this is a real charger. It’s also a three-panel charger in a foldable polyester case. There’s a micro-IC chip to moderate amps in different light levels. We’re talking over two full amps under direct sunlight. That will charge your phone fast. The entire unit is highly rugged and able to take a bit of punishment. Also, it only costs between $ and $ and comes with an awesome 18-month warranty. On Amazon, customers gave it a solid 4.2 out of 5 stars. Several people praised that it works incredibly well and provides a lot of power. One of those was a Marine who said it kept his 10,000 milliamp power pack charged while in the field. One of the main complaints people had was that it wouldn’t charge iPhones. Like we said earlier, all of the solar power packs we reviewed are great. 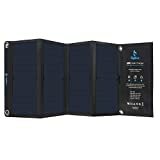 Trying to find the best solar panel for backpacking is a tall order. However, if we had to pick one, we would go with the Anker 15-watt solar charger. It’s powerful, compact, rugged, and has fantastic reviews. If the Marines trust it, then we will, too. Another one we like is the Nekteck 21W Solar Charger, which is the highest-rated charger on Amazon. Either way, you can’t go wrong. What do you think? Do you have a favorite portable solar panel that we missed? Let us know in the comments!